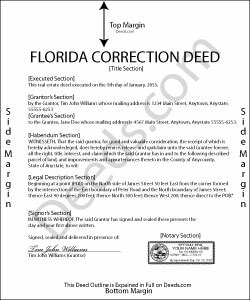 Correct common errors in a deed, such as typographical mistakes or omissions in various sections of the original deed, by using a corrective deed, which must be signed by the grantor and witnesses and re-acknowledged. The Florida Bar Association points out that the lack of a date or a wrong date does not invalidate a deed according to Florida Uniform Title Standard 3.6. They recommend against correcting deeds that are valid in spite of an error. When title has not passed to the grantee due to an error, however, use of a corrective instrument can be crucial. This would be in the case of an insufficient legal description, a lack of witnesses, a failure to obtain joinder of a grantor's spouse on a deed to homestead property, or if the deed lacks proper acknowledgement so that its recording does not impart proper notice. Five years after recording, however, a deed is presumed to be valid even if there was a defective acknowledgement or lack of witnesses (F.S. 95.231). A corrective deed is not capable of divesting an unintended grantee, which can be remedied by the new grantor passing title to himself and another grantee. A corrective deed is also incapable of re-vesting portions of the land back to the grantor. Both situations require substantive changes that must be made by executing and recording a new deed. The necessary elements for a legal conveyance must be present in a corrective deed, such as signature of the deed by the grantor in the presence of two witnesses, one of whom can be the notary. Constructive notice in the form of recording is necessary for the deed to be valid not only between the two parties but for prospective purchasers. Furthermore, the spousal joinder applies when the grantor is married and the property in question is the grantor's homestead. Title transfer of designated homestead property must be signed by the spouse to be valid.